The BMA Medical Book Awards take place annually to recognize outstanding contributions to medical literature. 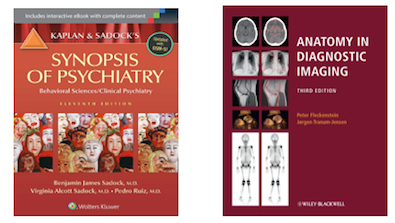 STAT!Ref is honored to receive awards for two of our titles from the British Medical Association: Kaplan and Sadock's Synopsis of Psychiatry: Behavioral Science/Clinical Psychiatry and Anatomy in Diagnostic Imaging. Highly Commended in the Psychiatry category, Kaplan and Sadock's Synopsis of Psychiatry: Behavioral Science/Clinical Psychiatry is a complete overview of the entire field of psychiatry for clinicians, residents, students, and all others who provide mental health care. First Prize in the Radiology category, Anatomy in Diagnostic Imaging, is an unrivaled atlas of anatomy applied to diagnostic imaging. The book covers the entire human body and employs all the imaging modalities used in clinical practice; x-ray, CT, MR, PET, ultrasound and scintigraphy. An introductory chapter explains succinctly the essentials of the imaging and examination techniques drawing on the latest technical developments. To talk to a STAT!Ref Team Member about these resources, or others within the discipline of Psychiatry or Anatomy, please feel free to call 800-901-5494 or fill out this form today. Next Will we see you at The American Association of Clinical Anatomists 2015 Regional Meeting?